Like many sailors, my dream was to retire and live on a boat, spending winters in sunny, warm, exotic places. My wife, Kathy, was unsure about this, but I was able to convince her that living and traveling onboard a boat would almost be like the camping trips we’d enjoyed for many years. We had been landlocked, never having a need for a boat, since spending weekends on a lake or a river never appealed to me. Nonetheless, I started thinking about cruising on a sailboat to faraway places. We took boating safety courses, enrolled in sailing classes on the Chesapeake Bay and put as much money as we could manage into a boat fund. 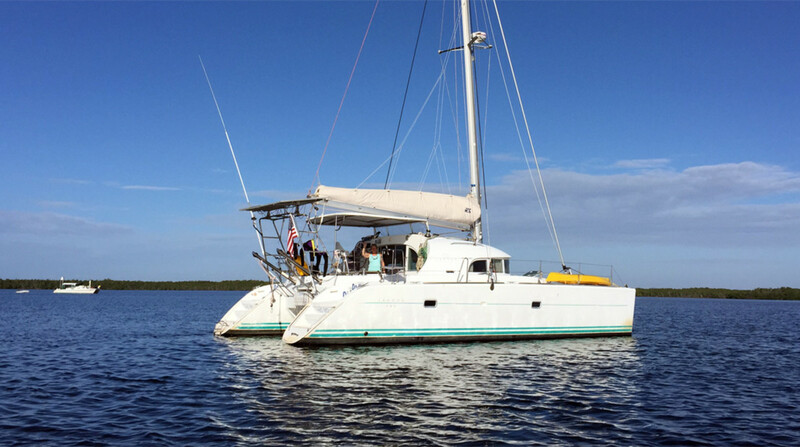 At first, I was thinking a nice 35ft to 40ft sloop would fit the bill, but with more reading and research, and really thinking about the idea of living onboard a boat, a multihull started to make more and more sense. We paid a visit to the Annapolis boat show. Big mistake. My wife loved the Lagoon 44, while I liked the Antares 44i. However, they were both too expensive for a couple of worker bees like us. There were also both pretty darn big first boats for a couple who’d never been cruising before. In 2011 I retired, and Kathy and I took a leisurely road trip down the East Coast from Annapolis to Key West and up the Gulf side of Florida. We visited old friends and family and looked at boats. We checked out at least 18 different catamarans, and soon narrowed things down to a 10- to 15-year-old Lagoon 380. The hunt was on. We found a fairly well-equipped three-cabin 380 online. After having the boat surveyed we decided it was the one for us. So, with our brand new (to us) 13-year-old Lagoon, we started our adventure, fixing the boat, upgrading things and generally making it our home. I had crewed on friends’ boats up and down the ICW before, and thought this would be a fun way to start our new life, so we began to plan a journey down the ICW to the Florida Keys. 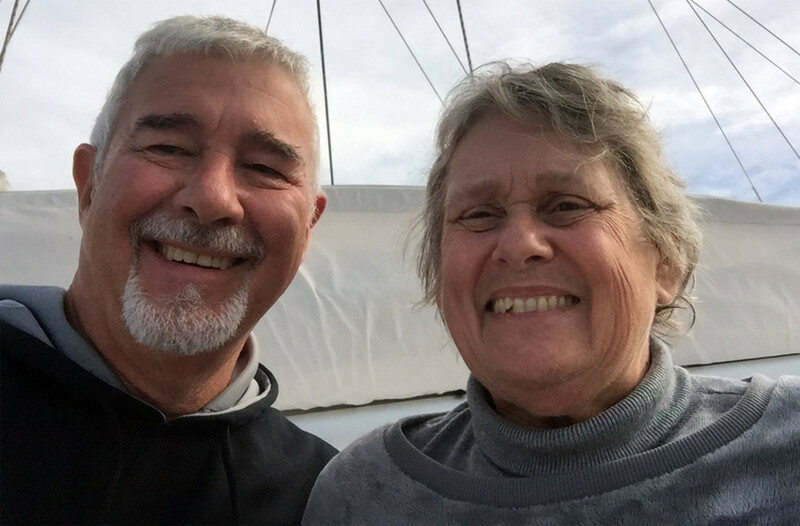 I saw an ad in SAIL magazine for the ICW Snowbird Rally and thought, “What a perfect way to begin our trip!” Mark and Diana Doyle, who literally wrote the book on transiting the ICW, were the guides, and former ABYC VP Tom Hale was traveling along for mechanical and technical support. We signed up. This was Kathy’s first extended trip on a boat, so we were fortunate to make our inaugural transit down the ICW with a great group of people. This took the pressure off me trying to make living aboard the boat an interesting, enjoyable experience. Seeing and experiencing something new every day, Kathy quickly learned that one must experience the joy of the journey and not worry too much about time. We had engine issues in Southport, North Carolina, and had to stay there for a few days waiting for parts. To catch up with the rest of the fleet, we decided to head outside and sail down the coast to Beaufort, South Carolina. We’d gained the confidence to do an overnight passage, which began with Kathy taking the boat out of the slip by herself— boy was I impressed and proud of her. From Cape Fear, we sailed overnight down to Port Royal Sound. Next morning, we motored into Beaufort and met the Snowbird Rally fleet just as it were making its way in—another great adventure. We’re still out here cruising and having a good time, meeting great people along the way and seeing new places.